Unlike so many politicians these days, Winston Churchill held a deep admiration for learning and science. A rediscovered essay—forgotten in a museum for nearly sixty years—reveals Churchill’s astoundingly scientific thoughts on such topics as cosmology, the origin of life, and the likelihood of extraterrestrials. Incredibly, he was all but certain that aliens exist. The 11-page, typewritten manuscript was rediscovered last year by a museum director, and handed to astrophysicist Mario Livio for analysis. Winston Churchill drafted the essay, titled “Are We Alone in the Universe?,” in 1939, and revised it in the 1950s, but it was never published. The essay reveals the degree to which the iconic statesman reasoned like a scientist, and how astute he was about concepts that have only recently emerged in the scientific literature, such as the number of planets in the galaxy, and the conditions required for planetary habitability. Not one to just speculate, Churchill is credited with several important inventions, including the “landship” during World War I (now known as tanks), and artificial harbors (so-called “Mulberry harbors that were eventually employed during D-Day). Though never completed, Churchill also green-lit a project during the Second World War to develop massive aircraft carriers made from ice. The man was never short of energy or imagination. 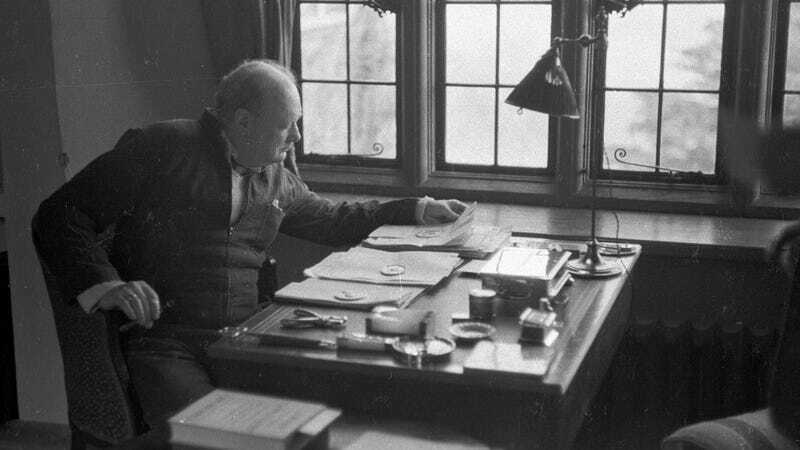 In 1939, just before the start of WWII, Churchill penned his recently-discovered science article in hopes of getting it published in London’s News of the World Sunday newspaper (Churchill wouldn’t become Prime Minister of Britain until May 10, 1940). He revised the article slightly in the 1950s while staying at his publisher’s villa. At that point, and in a reflection of changing cosmological sensibilities, he changed the title of the essay from “Are We Alone in Space?” to “Are We Alone in the Universe.” For reasons unknown, the manuscript remained in the publisher’s library, and was never published. The document stayed there until it eventually made its way to the archives of the US National Churchill Museum in the 1980s. The paper was finally rediscovered by the museum’s director, Timothy Riley, in May 2016. Riley, in turn, asked Livio to assess the science contained within. The essay, as described by Livio in a new Nature Comment article, reflects Churchill’s thinking on such matters as astronomy, and what we now call astrobiology. A believer in the Copernican Principle, Churchill refused to accept that Earth resided at the center of the universe, or that humans were somehow unique in the larger scheme of things. Churchill also makes mention of what scientists today call the Habitable Zone, the narrow region around a star that’s not too hot and not too cold, and a likely requirement for planetary habitability. Churchill thought that life can survive only in regions “between a few degrees of frost and the boiling point of water.” He said the Earth’s moderate temperature is largely dictated by its distance to the sun, and that planets, in order to cling to their atmospheres, need to have the sufficient gravitational influence. With these factors in mind, Churchill concluded that, outside of Earth, only Mars and Venus are likely to sustain life in our solar system. At the time, Churchill was working under a popular (but later discredited) theory of stellar formation drawn up by astrophysicist James Jeans in 1917. Scientists used to believe that planets formed from the gas that’s stripped from a star when another star passes too close to it (in reality, stars and planets form from a collapsing mass of dust and gas within a larger cloud called a nebula). Jean’s theory led Churchill to believe that such close encounters are rare, and that “our sun may be indeed exceptional, and possibly unique,” with respect to its many planets. Astutely, however, Churchill wrote, “But this speculation depends upon the hypothesis that planets were formed in this way. Perhaps they were not. We know there are millions of double stars, and if they could be formed, why not planetary systems?,” adding: “I am not sufficiently conceited to think that my sun is the only one with a family of planets.” Today, with the discovery of over 3,500 extrasolar planet candidates (and counting), we know that our galaxy is indeed teeming with them. Even at this early stage, Churchill was wondering about the number of potentially life-supporting planets in the galaxy. When considering the enormous distances involved, Churchill conceded that we may never know if these alien planets “house living creatures, or even plants.” Having witnessed tremendous technological advances in his lifetime, however, he speculated that it may eventually be possible to travel to the moon, Venus, or Mars. The reemergence of Churchill’s essay comes at a time when it’s fashionable for politicians to dismiss the importance of scientific discourse. The timing is not lost on Livio. Could the Nazis have starved Britain into submission? Is It Time to Accept That We&apos;re Alone in the Universe?